If you think primers are the only solution to your oily skin- think again. Makeup setting sprays can work just as good- or even better. You can think of them as your makeup’s topcoat. They seal your makeup and everything else in place. Like most of the products you use on your skin, choosing a makeup setting spray that will work on your oily skin can be tricky. And if it’s your first time to pick one, it’s easy to feel overwhelmed with so many choices. This is where this comprehensive guide fits in. We spent more than 30 hours to create this guide. We’ve consulted top makeup artists and beauty experts, examined hundreds of reviews from top online retailers and tested dozens of products just to make sure. You won’t have to go through the same lengthy and painstaking process. Now, for the best makeup setting spray for oily skin, check out our top recommendations below. This is the best makeup setting spray for oily skin because it is totally oil-free and really helps lock your makeup in. It leaves a matte finish on the skin so you can stay shine-free for the rest of the day. It’s a hard worker considering that this makeup setting spray makes sure your makeup doesn’t go all over the place. It will really keep your look last the whole day. Aside from locking your makeup in, this setting spray also prevents color from fading. You won’t have to worry about using too much product just to build up the color. Plus, I also find it convenient since a little amount sure goes a long way. What makes this the best makeup setting spray for oily skin is that it comes from an expert when it comes to setting sprays. Skindinavia is credited as the company that started it all. This lightweight formula can hold your makeup in for up to 16 hours. Popular among celebrities, this setting spray prevents color from fading and melting down, thanks to its ultra-fine mist. This finishing spray is the ultimate standard. Fewer retouches are needed throughout the day, and it makes sure that makeup doesn’t settle into wrinkles, fine lines, and pores. It boasts of its patented temperature control technology. This works by ensuring the skin’s surface stays cool to prevent makeup from sliding or melting. If you are a professional makeup artist, you surely wouldn’t to miss this product. Originally made for those in theater, this setting spray is known for its durability. It is water-resistant, making it perfect for people who sweat and perspire a lot. This product is literally like glue for makeup. A lot of performer-customers have sworn to this, and if it adds to your excitement, this is also the product used by Disney princesses. It leaves a matte finish, too. Despite the great benefits it offers, I need to stress out that this product isn’t for everyone. It’s fragranced which means that it has the potential to cause irritation, especially those with sensitive skin. If you hate constant retouches, you have to try this best makeup setting spray. With a just a few sprays, your makeup will last the whole day while leaving a translucent matte finish. It doesn’t interfere with SPF, and provides added moisture with its Aloe Vera extract content. This product won’t clog pores and dries quickly without leaving a sticky feel. This makeup setting spray is also water-resistant. No amount of tears can wear this baby down- not even humidity. Aside from being one of the best makeup setting sprays for oily skin, this enhances the effect of beauty products as moisturizers and creams work best in hydrated skin. This product is also known for its versatility. It can serve as a sensitive skin tonic, a soothing freshener and a cleansing aid. Even athletes are known to use this spray. Since it is a face and body cream, you can feel free to use it wherever you experience skin It can also be used as a hair and skin moisturizer, too. Just spray some during the dry weather, and the result is hair and skin that’s softer and fresher-looking. Applying makeup is certainly no joke. You spend hours searching for the best products, spend a decent amount of money, and put in a lot of effort just to achieve that perfect look. But after just a few hours, when you look in the mirror, all of your hard work just went to waste.And thanks to setting sprays, you won’t have to deal with these things anymore. We know how frustrating this is, and that’s why makeup setting sprays were invented (thankfully!). They work the way powders do in that they help set makeup and help control oil. But, since they come in liquid form, setting sprays won’t change the way your makeup looks. They help set your makeup in place without looking cakey. After your makeup, simply spray an “X” and a “T” shape over your face to ensure full coverage. Allow the product to dry naturally and avoid rubbing it in. Blotting papers or powders are no longer needed. Just spray as needed for that fresh and oil-free complexion that lasts. Use it on your foundation sponge. Adding moisture to the sponge makes the foundation more workable and the setting spray helps prevent it from wearing off throughout the day. Spritz some on your eye shadow brush. Setting spray helps you achieve that pigmented, bold color you want without having to apply multiple eye shadow coats on your lid. Spray it on your under-eye concealer brush. Dampening your concealer brush will make the concealer more blendable, and it also helps the concealer look more flawless and smooth. Having makeup in places it shouldn’t be in is not a pretty sight to see. If a scenario like this looks familiar, then you better listen up. If you think that primers are all you need for a long-lasting makeup, think again. Primers only make half of the equation—the other half calls for makeup setting sprays. 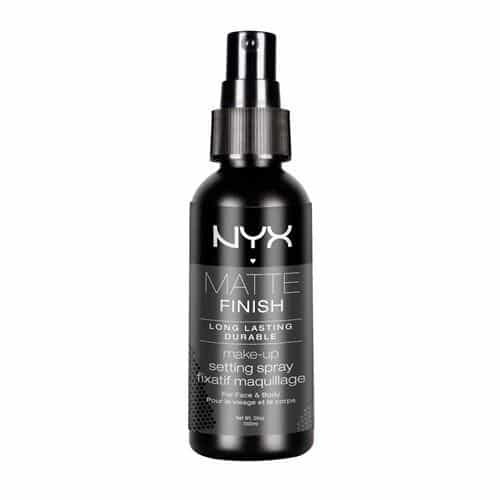 We’ve chosen N YX’s Makeup Setting Spray – Matte Finish as the best setting spray for oily skin Aside from making your makeup long-lasting, it also provides a shine-free, matte finish. This product is also very lightweight. It works hard to make sure that your makeup stays in place without the sticky feel.